Our design plans. First steps. I wonder what is your approach in a new-to-you garden – clear everything out and start from scratch or work out which plants you want to keep and work them into your design/work round them? Are you prepared to work with the topography you are presented with, or do you want to do wholesale earthworks to change the shape and levels to your requirements? Do you want to design and build your garden yourself, or do you want to hire in professionals to design it and provide you with a planting list, perhaps even get the designer to project manage contractors to deliver that agreed design? In a garden this big, with a very limited budget our aim was to do it all ourselves, whatever “it” was. In a nutshell over the course of that first year we thought about what we wanted to use parts of the garden for, and I gradually formulated design views on what we should do. We would retain (and almost completely replace) the concrete path that ran straight down the right hand side of the garden as our “utility path” the direct route up and down which a wheelbarrow/sackbarrow could navigate, sloping with the contours of the garden but with no steps. I decided that we should break up the huge rose bed, removing the wire borders the previous owner had put round it, take out a couple of poorly hybrid tea roses and put winding paths through it so it didn’t look like one big square – turning it into three big beds each a different random shape to the others. We should retain a square lawn between the bed of pink roses and these new beds for the washing whirligig, and a seat, and flank that on the right hand side with a pergola over the utility path right the way down to the Rosa 'Pink Grootendorst'. Past the Pear Trees we should build a patio with a pond beneath it and a bog garden, with steps down beside it. Where the Lonicera nitida hedge was we should remove that and build a wall instead so that the existing breeze-block shed looked on the pretty side as if it was all one with this wall so that we could plant our fig, Ficus carica ‘Brown Turkey’, (brought from the old house in a pot) against it and fan train it. In front of that wall should be a Mediterranean Courtyard. This as you may remember from last time was where the hospital bed was, and whilst it was flatter, the area would need to be properly flattened by digging back into the hill. There was a patch of hillside between the proposed pond and the proposed Mediterranean Courtyard that as yet I didn’t know what I was going to do with – how do you horticulturally join a bog garden to a Mediterranean Courtyard? Plus the amount of earth moving involved on that slope to deliver a flat patio and a pond at the top, as well as digging into the slope at the bottom meant I could not visualise what size or shape of space I would be left with. I would think about it. In terms of plants I would try and retain healthy roses, shrubs and trees that were not overbearing and out of proportion, (ie the leylandii would have to go!) I would try and regenerate old and out of shape shrubs by severe pruning, and if they responded they could stay so as to provide height, and make the whole garden not look too new. But inevitably there were to be a few plants that were just in the wrong place and were too big to sensibly move. I would try and take cuttings to make new plants that could be put into a more suitable place in the new design as these were clearly plants that liked our growing conditions, and we like to garden with things that like our conditions. So I consulted my pruning bible “The Gardening Which? Guide to Successful Pruning” that my Mum gave me in 1995 on the best method of rejuvenating our old shrubs and set to. In principle the Forsythia, the Weigela, the Philadelphus and the Fatsia japonica all were to be treated the same way in terms of HOW you pruned (cutting out one in three stems to the ground) but WHEN varied. The first three you prune after they have finished flowering as they flower on wood produced last year. If you prune them at the wrong time, you reduce or prevent the flowers the next year. 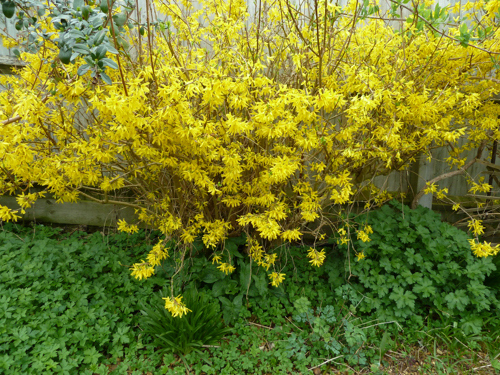 So the Forsythia gets pruned March/April, both cutting out one in three old stems, and reducing the height of the remainder by a third. As you can see from the picture I don’t have it in a neat geometric shape, but it flowers beautifully. 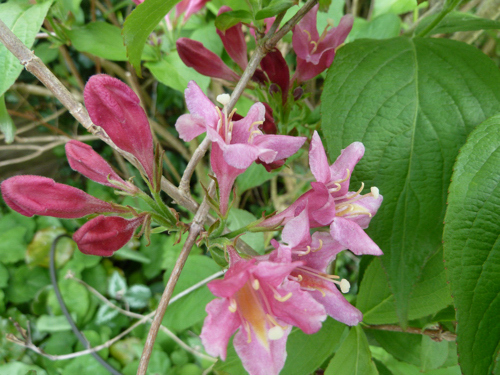 The Weigela and the Philadelphus were both tall and congested. They had big boles covered with Ivy at the base, and further suffered from having a 2m panel fence directly behind them. This meant they tended to grow tall and forward onto the path. I have not been able to eradicate all the Ivy – the roots of the plant are entwined with those of its host and the stem is so enmeshed with the shrub it is on, I cannot cut it completely out without damaging the host - so I have to contain it. The second year I tried to get the Ivy off the base of the Weigela I discovered some bumblebees were nesting in a hollow part of the trunk, and my face was about 5cm from their nest entrance as I struggled with the Ivy. Suffice it to say, that year the Ivy stayed put! Both of these shrubs are pruned in June when they have finished flowering. The first three years I had to have help to lift the huge branches of the Weigela as I took a third of the oldest growth out each time. The trunks of the branches of the Weigela were tough, and the pruning saw took ages to cut through them. My husband was called on for some of them, and used his bow saw on the biggest ones. The weight of the trunk bearing down on the cut makes it a two person job – one to push the trunk whilst simultaneously keeping all the other branches out of the way of the other person sawing. Lots of scratches come my way when pruning. As I was removing all the old growth over three years I didn’t further shorten all the other branches, shaping the bush would come later if it survived the drastic treatment. Fortunately the branches of the Philadelphus, (probably Philadelphus ‘Sybille’), were more slender but more numerous and closer together, making cutting out the correct ones more complicated. Both of these shrubs have survived, though the Philadelphus is not producing as many new shoots each year now. I have taken cuttings of both from the prunings, and have several small Weigela plants growing on for the Long Border, but I have been much less successful with getting a cutting of the Philadelphus to take. It isn’t possible to get far enough away from them to take a picture of the whole shrub to show you how they look now, but here are some flowers coming in the Weigela (Possibly ‘Bristol Ruby’) in late April this year - each year I hope it will flower whilst the Rosa ‘Canary Bird’ opposite is still in flower, and some years it does. This is one such year. The Fatsia japonica was very big, and covered the path completely – you had to walk on the grass to get by it. It was also quite yellow. I gave it some chelated iron to help its yellowing leaves (and I gave some to the pear trees that were also yellow-leaved.) My pruning book said to take out one in three stems in spring, so I tried to balance out which ones I took so that there were still stems and leaves all round. It really didn’t like it, and the following year had not made any new growth from where it was cut. I didn’t cut it any more the following year, and apart from mulching, left it. After sulking for a year the Fatsia japonica finally began to put out some new growth, but not very much, so I have taken much longer to rejuvenate it compared to the other shrubs. One big branch every other year, as it was essentially five huge branches when you got down to the ground. Whilst it is still yellower than most people’s Fatsia japonica plants, it is putting out lots of new growth this year. 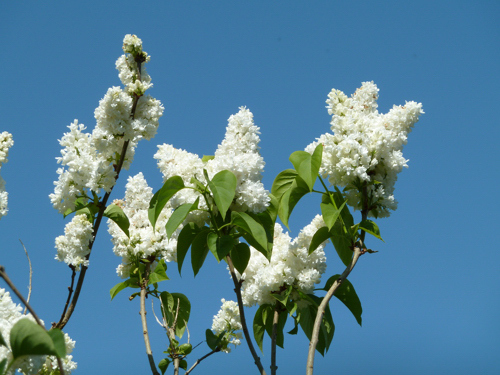 Our pruning book said our White Lilac, Syringa vulgaris ‘Madam Lemoine’, could be cut down to just stumps 30cm from the ground if we wanted to do a drastic rejuvenation but it would not have flowers for two or three years. I was keen, my husband was not, so we cut a quarter of it out to stumps in winter. However, it was covered in Ivy and surrounded by bird-sown Holly and Elder trees, and we didn’t spot that we had left the branches that were reverting to common purple (until it flowered). The following year we did manage to trace the purple back to the ground by the simple measure of tying string to the branches of all the purple flowered bits in the Spring. These were cut out as low as we possibly could manage. We left all the white flowering branches that year, then started again the following year cutting a quarter of those out. The trunk is so old and split that you can’t cut it to 30cm from the ground without losing the whole tree, so we cut the branches back to 30cm from the main bole. It is still tall and gangly – not possible to deadhead without very tall step ladders but the scent from the flowers is fantastic and the flowers look great against the blue sky. So last year we took more drastic action and cut all but one stem down to about 45cm from the bole in an attempt to get more growth nearer my nose height. Which means this year we have a branch at the back hanging over next doors fence that will have a few flowers on it, and a bit of new growth more at chest height. Fingers crossed we get flowers next year I can sniff without bringing stepladders. 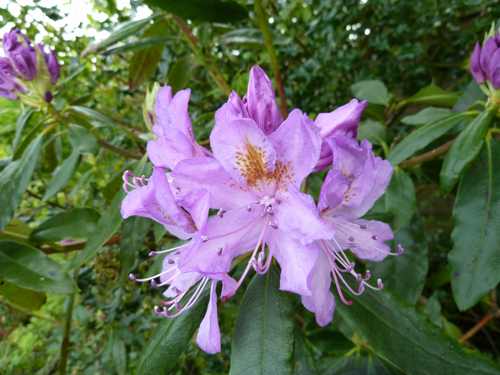 I would like to tell you I consulted the pruning book on our Rhododendron ponticum but that would not be true. They were very weedy and poorly looking with black marks on the leaves and very straggly in growth. I cannot now even remember when in the summer it was that I sheered them off at ground level all the way round, it was whilst I was weeding the bed and couldn’t reach to the weeds behind the Rhododendron, so cut it all down. I did leave the stumps and roots in the ground as I was on a mission to finish weeding that bed, and then forgot to dig them up as the herbaceous plants grew over them. With no help from me they put on new sturdier growth, and the next year grew healthy leaves. Then lots of buds and flowers each year since, as you can see from this picture from May last year. Next time, turning design views into design plans and starting to implement them. 0 Comments To "On a Chalk Hillside June 2017"